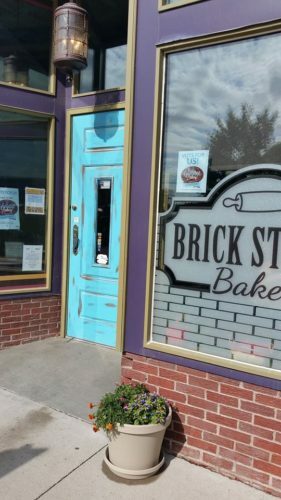 Brick Street Bakery, located on the west side of Adel’s historic courthouse square, opened in 2016 to meet the growing demand for baked goods and pastries from Brick Street Books & Cafe. The Bakery makes doughnuts, muffins, scones, breads, pies and cookies fresh each day, and serves a house dark roast coffee freshly roasted by our buddies at Raccoon Forks Foods in Ames. In the fall of 2017, the Bakery expanded its hours and is now open on Saturdays. The Bakery also started selling pastries in Des Moines' East Village at Plain Talk Books & Coffee. A patio featuring outdoor seating, with an excellent view of the Dallas County courthouse, is scheduled for completion in 2018. As a Raccoon Forks microbusiness, Brick Street Bakery provides job opportunities to individuals with disabilities and other barriers to employment. Employees at the Bakery receive one-on-one job coaching and the support they need to build skills and be successful on the job.